At its recent annual banquet , the Johnston County Farm-City Week Committee recognized the Jeffery C. Lee family of the Meadow community and Carolina Packers Inc.
Lee farms the same land his ancestors purchased before the Revolutionary War, but that’s not all of his story. His family lost that land during the Great Depression but remained on the land as sharecroppers and then as renters of the land. After graduating from South Johnston High School in 1973, Lee went to work on the family farm, where he started with three acres of tobacco. He took over the reins of the farm when his uncle was ready to retire, and under his guidance, the operation expanded, and in 2005, the family was able to buy back the land it lost in the Depression. Today, Lee tends about 225 acres of tobacco, 650 acres of sweet potatoes and 600 acres of cotton in Johnston, Sampson, and Harnett counties. In 1940, local investors recruited John A. Jones Jr. to launch Carolina Packing Co. He was well qualified for the role: As an employee of Cudahy Packing Co. in Claxton, Ga., he had gained experience in meat processing, including a recipe for red hot dogs. The opening of Carolina Packing Co. allowed farmers to sell hogs and cattle local. After that first year in operation, Jones named the company’s name to Carolina Packers. In its earliest years, the company sold fresh cuts of pork and beef to local grocery stores. Later on, it began making sausages, hot dogs and bologna. Jones’ son, John A. “Buck” Jones Jr., joined the business in 1956 after graduating from college and serving in the U.S. Air Force. In 1977, he became president of Carolina Packers. 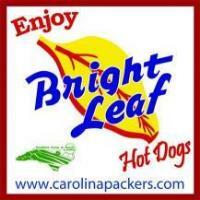 In 1997, Carolina Packers discontinued slaughtering animals at the plant in order to focus on making its well known Bright Leaf Hot Dogs. After Buck’s death in 2005, his wife, Jean Lassiter Jones, took over as president of the company and continues to this day. Bright Leaf hot dogs are now the official hot dog of the East Carolina University Pirates, the Carolina Mudcats and Durham Bulls. At the banquet, the Farm-City Week Committee recognized the Strickland’s Crossroads and McGee’s Crossroads 4-H clubs for collecting the most food in the Hungry to Help drive benefiting BackPack Buddies. Food collected during the banquet went to the BackPack Buddies programs at West Smithfield Elementary and Selma Middle schools.